Nationally available in stores and online today, Slightly Stoopid releases a special HD DVD + 2 CD set recorded live at TRI Studios (San Rafael, CA), featuring guest artists Bob Weir, Ivan Neville, Ian Neville, Karl Denson, Don Carlos, and a rare interview segment moderated by Tommy Chong and Weir. Slightly Stoopid & Friends: Live at Roberto's TRI Studios is on sale for $19.99, and a four-part HD download of the session is now available on slightlystoopid.com for $4.20. A portion of the DVD proceeds will benefit two charitable organizations: Save The Children and World Food Programme; to date, $10,000 has already been donated to these two organizations on the behalf of Slightly Stoopid and TRI Studios. Interviews and photos of Slightly Stoopid are available upon request. On September 13, 2011, Slightly Stoopid partnered with Bob Weir (Grateful Dead, Furthur) and longtime Grateful Dead sound engineers Dennis "Wiz" Leonard and John Cutler for the standout live performance on TRI Studios' state-of-the-art Meyer Sound Constellation System. Utilizing advanced acoustical technology from Meyer Sound, artists are able to emulate the acoustic properties of any performance space ranging from small nightclubs to a Roman cathedral, Wembley Stadium to Madison Square Garden, or anything in between. The unprecedented innovation invites artists to truly experiment with their sound, and connect with their online fan base in new sonic ways. James M. Wisner, Slightly Stoopid's Grammy Award-winning sound engineer, comments, "Working with the Meyer Constellation system was like stepping into a giant reverb chamber. The ability to change your perception of the room with a touch of a button takes live sound into another dimension." Wisner has been recognized with Grammy Awards and nominations for his engineering work with such artists as Jennifer Hudson, Amy Winehouse and Toots and The Maytals. TRI Studios is a world-class live video streaming venue, where audiences experience unparalleled access to their favorite artists. Slightly Stoopid & Friends: Live at Roberto's TRI Studios features 31 live songs (acoustic and electric sets), behind-the-scenes rehearsal footage, and as mentioned above, a rare interview segment with Chong and Weir. From July 10 - August 24, 2013, Slightly Stoopid's 7th annual summer tour continues the tradition of bringing some of today's most lauded acts on the road together to appear at outdoor amphitheatres across the country. This year, Slightly Stoopid teams up with renowned Minneapolis hip-hop collective, Atmosphere, supported by the heavy-hitting horns and funky rhythms of NYC's The Budos Band (Daptone), notoriously savvy Bay Area Living Legends MCs The Grouch & Eligh, and rising San Diego local Tribal Seeds. Hitting 28 cities, the "Kickin' Up Dust" tour is guaranteed to create a trailblazing summer soundtrack, and a noteworthy rite of passage for summertime concert-goers. 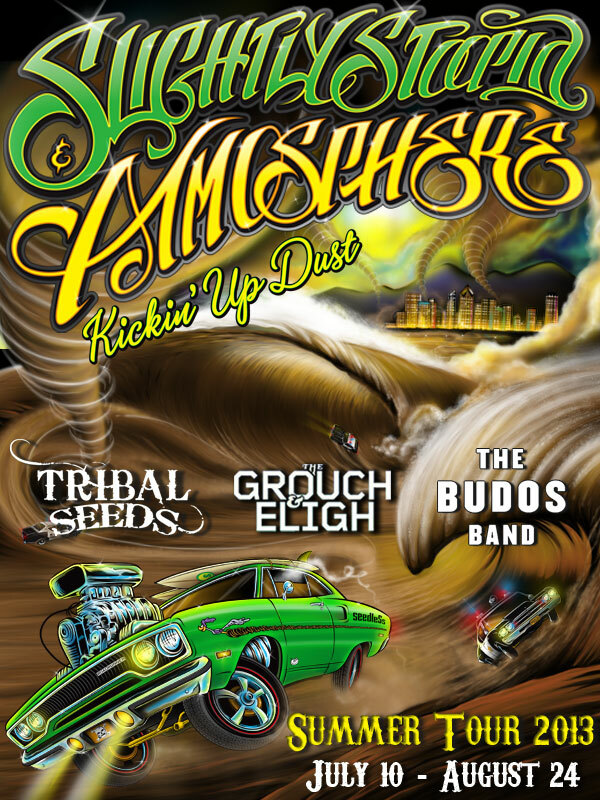 The "Kickin' Up Dust" tour comes on the heels of Slightly Stoopid's hugely successful album, Top Of The World, and the release of Slightly Stoopid & Friends: Live at Roberto's TRI Studios. Stoopid will hit select West Coast, Midwest, East Coast, and Southern markets on the forthcoming Spring 2013 Tour and the "Kickin' Up Dust" Tour. Tickets are now on sale at SlightlyStoopid.com.